You know, I try to live my life whereby I never deliberately group everyone together or seek to generalize people, but for the most part, as I see it, we live in a nation full of hypocrites. I choose to use the term “hypocrisy,” especially as it relates to the outpouring of love, support and legislation that is given to certain groups of people versus others – namely Black people. I wish I could say I’m surprised with the level of love, support and legislation that society, as well as the mainstream media, provides to members of law enforcement versus the level of love, support and legislation that is afforded to a group like Black Lives Matter, which was formed to advocate for unarmed Black people who were senselessly murdered by members of law enforcement with no accountability – but I’m not surprised at all. It is sad that the only time you seem to get collective sympathy from a group of American citizens, is when a person’s skin is not Black; when a person has on a law enforcement uniform; or when it happens to be a dog that was killed or a gorilla being shot to death. I am not saying that those things are not worthy of our overwhelming support and sympathy, but I do question the way many Americans, along with many mainstream media outlets go out of their way to show that overwhelming support and sympathy, in a way that is far different when it involves Black victims of domestic terrorism. Again, it is the ultimate form of hypocrisy. And then HB 953 comes along! You’ve heard about HB 953 haven’t you? It’s the bill that was signed into law by John Bel Edwards, the recently elected Democratic governor of the state of Louisiana. HB 953 is a slap in the face to Black people across America and to the Black Lives Matter movement specifically. 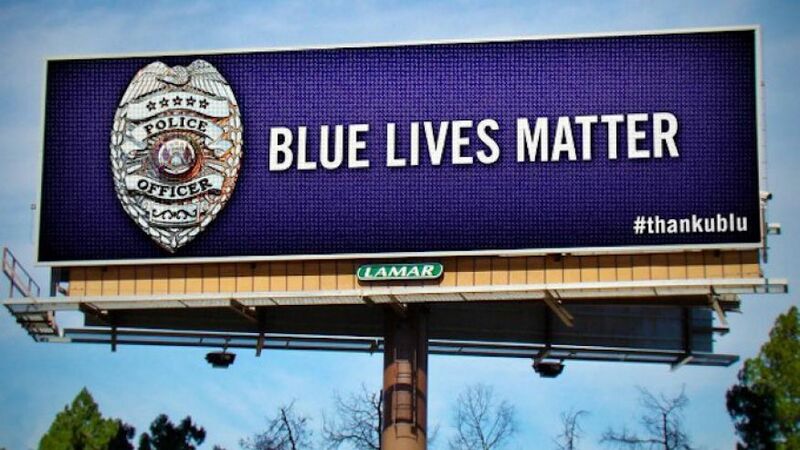 Thanks to good ‘ol Governor Edwards, Louisiana became the first state to pass a “Blue Lives Matter” statute, which adds police officers and firefighters to the list of protected groups in this country, with heightened penalties that are levied against people who are charged with targeting and committing a hate crime against them. Are you freaking kidding me? A hate crime? That’s right! HB 953 expands Louisiana’s existing list of groups protected against hate crimes on grounds of race, age, gender, religion, color, creed, disability, sexual orientation, national origin or ancestry. It adds law enforcement officers, firefighters and emergency paramedics to the list of protected groups and increasing the penalty to five years in prison and up to a $5,000 fine for anyone who commits a felony hate crime against this newly protected group. So let me get this straight. According to statistics, the number of police officers who were fatally shot has significantly decreased over the past four decades, with only 41 police officers being killed in 2015. Interestingly enough, statistics show that 1,146 people were killed by police during the same 2015 calendar year, with Blacks being more than twice as likely to be fatally shot than Whites. But, you mean to tell me that police officers are the ones who need legislation? Black people have been screaming for local officials, state officials, federal officials, the Justice Department, President Obama, God and anyone else who will listen, to do something to address this injustice and disparity. There is no doubt in my mind that this was a direct slap in the face to Black people and members of the Black Lives Matter movement, who are seeking change. You’ve got people out here, including many Black folks, who have joined in with others to blame the Black Lives Matter movement for almost everything that’s happening in this country. Where have the majority of other races been at when Black people have been demanding justice concerning unarmed Black killings by law enforcement? I will wait for a justifiable answer. The majority of Americans and the mainstream media have betrayed Black people for a long time with their deafening silence, as we’ve been catching hell in America for all these years. It saddens me that some Black people are so quick to join in and support everyone else’s struggle, but not our own. This “Blue Lives Matter” statute, that is a part of HB 953, lets me know that the Black Lives Matter movement is an effective and much-needed movement. Whenever people, who express their disdain for something, go out of their way to blatantly imitate it, it’s a good thing. If the people who rail against the ‎Black Lives Matter movement, yet support the “Blue Lives Matter” legislation, don’t have the same conviction and passion to rail against police brutality, then I have no respect for them. Bad cops endanger everyone, including their fellow good cops. If you truly believe “Blue Lives Matter” and “All Lives Matter,” then hold bad cops accountable for their rogue and irresponsible actions, so as to protect their fellow officers from these attacks that rarely ever occur, and for the sake of protecting unarmed Black people from being constantly murdered at the hands of those rogue and dangerous officers. If “Blue Lives Matter,” stop demonizing the Black Lives Matter movement. The legally sanctioned killing of unarmed Black people in America must cease.